Lightwave Link Inc OLPM (Opcal Line Protecon Module) is combined with opcal switch, opcal spliter and opcal power monitoring funcon. The OLPM is consisted of one 1x2 opcal switch, one 1x2 opcal spliter and PD monitoring. The subsidiary electrical circuitries are for driving opcal switch, performing PD monitoring and demarcang PD linear range with I2C interface. The main funcon of OLPM are spling opcal signals, selecng opcal light path and monitoring the opcal power. 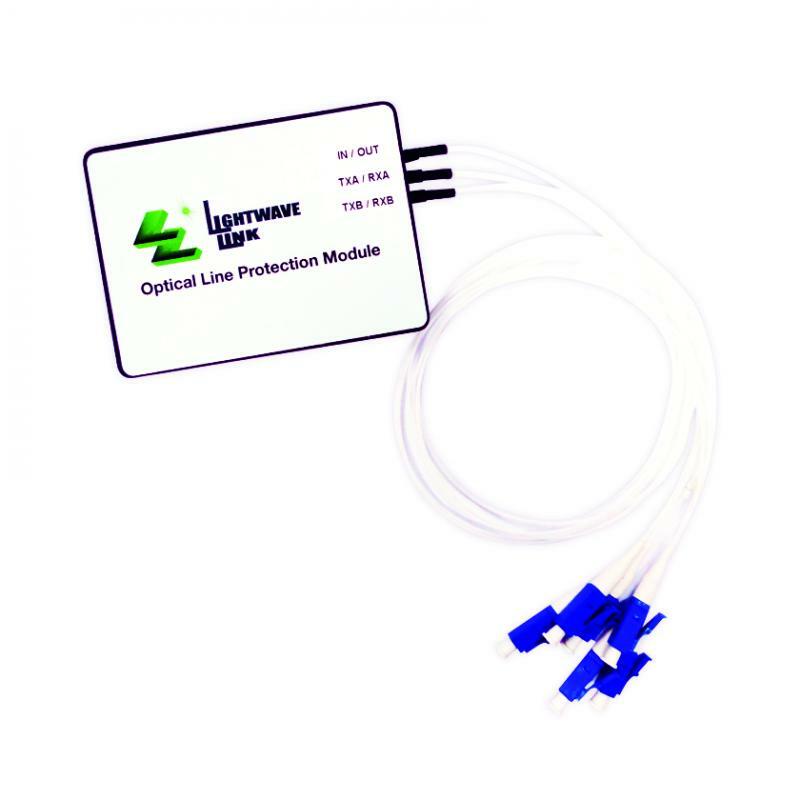 Lightwave Link Inc OLPM comply with TELCORDIA GR-1312-CORE. Input port (IN) light signal output to TXA and TXB via 50/50 spliter. Light signal is from RXA to Tap1, 2.5% for opcal power monitoring and 97.5% for transmission to 1x2 opcal switch. Light signal is from RXB to Tap2, 2.5% for opcal power monitoring and 97.5% for transmission to 1x2 opcal switch. Output port (OUT) will output the light signal from RXA and RXB via selected opcal path by 1x2 opcal switch. The PD monitor results (analog signals) will convert to digital signals by AD convertor and output to management system via I2C interface. There are opcal switch driving circuitry inside and control the opcal switch’s status via electrical pin and ming signals. There is EEPROM with I2C interface to keep two demarcated PDs’ linear ranges. There is online funcon inside for status judgment from management system. There are 40 opcal power data in EEPROM, the opcal power of AD monitoring will compare with EEPROM and find the opcal power range then upload to management system. Split the input light source to two paths by 1x2 spliter (IN→TXA/TXB). Monitoring the opcal powers from RXA/RXB and feedback to management system via I2C interface.Management system will control the opcal switch via subsidiary circuitries to obtain the opcal light path selecng funcon.